If you’re using a smartphone, you’re by now aware of the term Picture-in-Picture, probably. 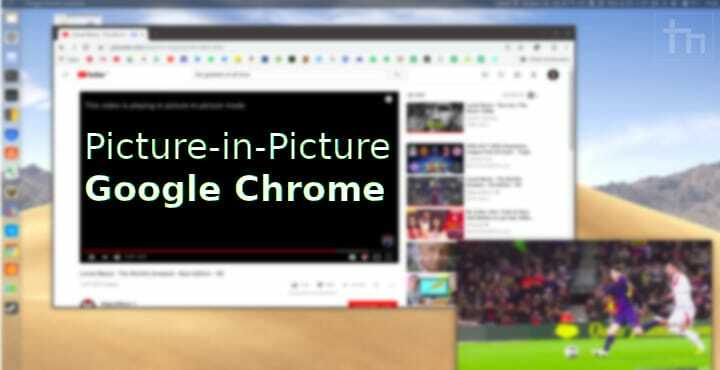 Picture-in-Picture is a feature that allows you to watch a video in a floating, resizable window outside of a web page or a dedicated video app. It’s not an entirely new concept and has previously been implemented in iOS, Android, and even browsers such as Safari and Opera on the desktop. 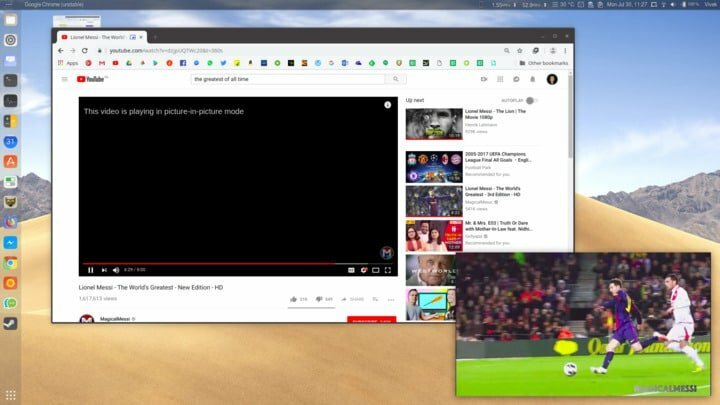 Google Chrome is now also bringing Picture-in-Picture (abbreviated commonly as PiP) to the desktop. If you’re using, or at least willing to use Google Chrome beta or Google Chrome dev, you can enable it right now. The Picture-in-Picture window is always on top of other windows so you can continue to watch videos while doing something else. For instance, watching a football match while also working on that thing you have to work on. You can browse other websites, shop, do anything you want while the video continues to play and be visible. PiP is mostly used with the YouTube app on Android and iOS where it provides an easy way to watch videos while texting or something else. Before we go ahead and show you how to enable it, here’s something you should know. Picture-in-Picture is an experimental feature and not enabled by default. It only works in Chrome beta or Chrome Dev. Although the experimental flags that turn it on are available in the stable Chrome release, PiP doesn’t actually work. There is no need for an extension from unknown sources or anything fishy. This feature makes use of the W3C API proposal that aims to define a web standard around the feature. This should help other web publishers to add support for it for their online videos in a predictable, uniform manner. The PiP modes on Android and iOS do not follow these standards nor does Opera but Safari on macOS does. Linux users running the GNOME desktop have also had the option available through the Window Corner Preview GNOME extension. Having the feature baked right into the browser is a lot cleaner though. Besides, having a standard means a better user experience for all. The suggested API this feature makes use of, as well as the Picture-in-Picture itself, are both in beta right now. Other than YouTube hardly many sites support it as of now. But YouTube is just enough, isn’t it? To enable this experimental Picture-in-Picture support you’ll need to enable two chrome flags. If you’re worried this might cause troubles with the browser’s stability, you can just as easily turn these off. These flags are available on all desktop platforms that Chrome is available on even if you’re running the stable version. You can still turn them on, regardless of that. 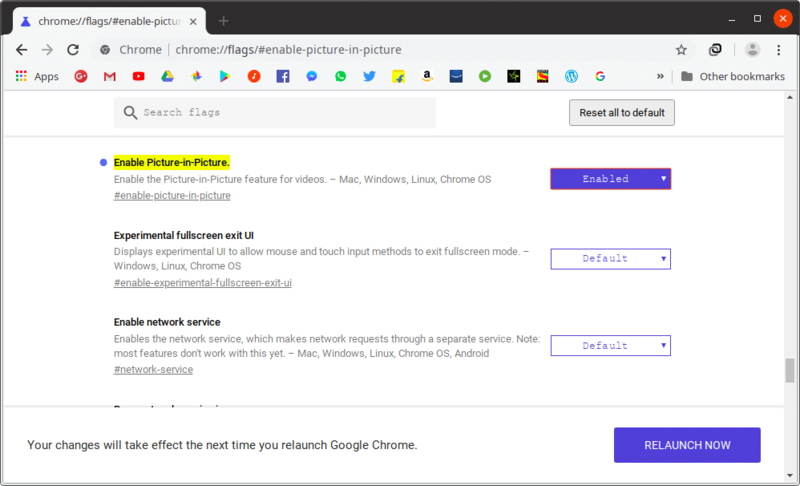 However, it most probably will not work even if you do enable the right flags if you’re using the stable Chrome release. Launch Chrome Beta or Dev, and head to the following address. Click on the RELAUNCH NOW button at the bottom and you should be good to go. As mentioned before, not many sites other than YouTube support this feature right now. So if you want a taste of it, head over to YouTube and look for a video you want to play. When the video is playing, right-click on the embedded video and you’ll have your usual YouTube style context menu. 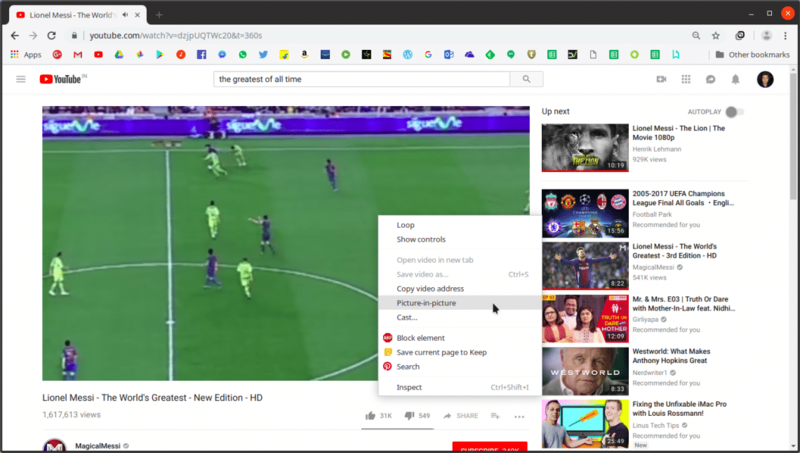 Right-click on the video once again and you’ll have the browser’s context menu where you’ll find the Picture-in-Picture option, click on that. Or you can just play the video below and double right-click on it just to test this out. The video will pop out and appear in the bottom right corner of your screen. This borderless window can both be moved and resized but keep in mind that it will be floating above all other windows and not just Chrome. The PiP window does allow you to play or pause the video but to do anything more you’ll have to use the controls on the web player the video originates from. Videos can also autoplay in PiP if you have it enabled on the website you’re watching videos from which in this case is YouTube. Closing the tab the video is playing from will close the video as well.